Morning folks! How are we this Saturday? Good I hope. 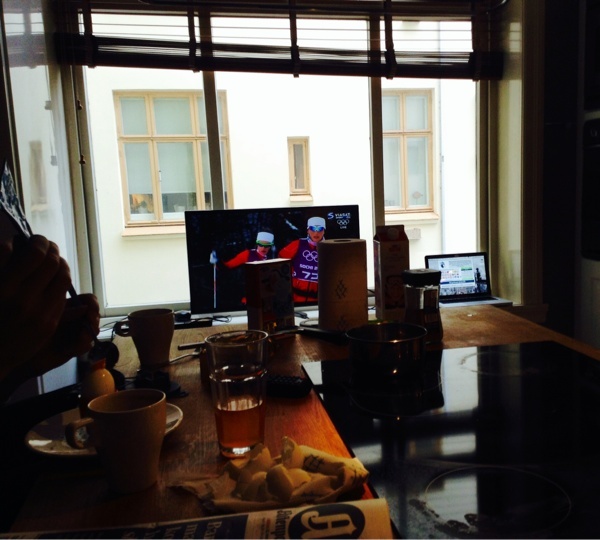 I'm awesome, have just finished my breakfast and now we're watching Olympic Games. It's skiing on the schedule, 30 kilometers for women, and we have some hope for a Swedish medal (knock-on-wood), so it's going to be exciting. Also I am not working today, as you can probably tell. I was suppose to, basically everyone was, but we got told yesterday evening that we all have the weekend off. This made me very happy, to say the very least (ok so it's always fun to make money but it's also fun to sleep in the morning). It's been a rather long work week (which felt like it went by very fast though), so two days off is like a mini holiday. Yeah, and now it's almost competition time so I don't have time to talk to you anymore. Have a nice day loves.